The Canadian dollar fell sharply immediately after the release of the Bank of Canada’s Official Statement providing a more bullish forecast for the economy while holding rates steady. The Bank hiked its estimate of noninflationary potential growth, implying there was more room to grow without triggering rate hikes. The central bank now suggests the economy has a noninflationary speed limit of 1.8% this year and next, accelerating to 1.9% in 2020. Formerly, the Bank had estimated potential growth to average about 1.6% for the next two years. Many market participants had expected a more hawkish statement as inflation has risen to close to the Bank’s 2%-target in recent months. The central bank appears to be straddling the fence, suggesting that rate hikes are coming, but the economy still needs stimulus. 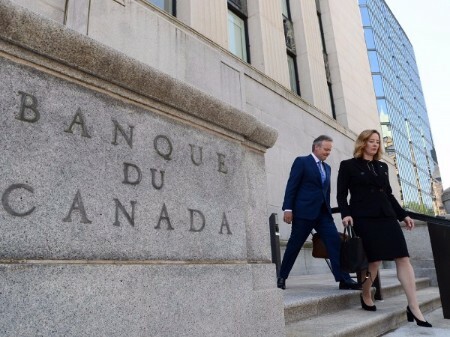 The good news is that growing demand is generating new capacity as businesses invest to meet sales, a development that Governor Poloz says the central bank has an “obligation” to nurture. The Monetary Policy Report (MPR) notes that three-quarters of industries have a capacity utilization rate within five percentage points of their post-2003 peak. The business outlook survey, meanwhile, indicates that sales expectations have firmed. Taken together, this implies that there’s a real need for investment to meet higher demand. The chief concern is that protectionism, which remains the central bank’s top risk to the outlook, coupled with the U.S. tax overhaul means businesses will choose to expand capacity outside of Canada. A “wide range of outcomes” is still possible for the NAFTA, according to the MPR, which did not acknowledge recently reported progress in talks between Canada, Mexico, and the U.S. The central bank now sees first-quarter growth at 1.3%, down from a January forecast of 2.5%. Forecasts for 2018 were also brought down to 2%, from 2.2%. But 2019 growth was revised up to 2.1% from 1.6%. This stronger growth profile reflects upward revisions to the U.S. fiscally induced expansion. Slower growth in the first quarter primarily reflected weakness in two areas. 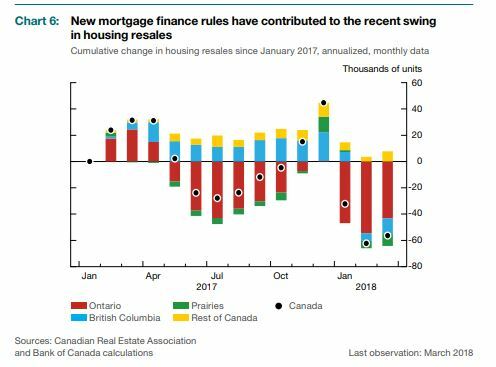 Housing markets slowed in the wake of the new mortgage guidelines. Exports also slowed, in part owing to transportation bottlenecks. Bottom Line: Despite upward revisions to inflation, the Bank’s assessment seems to be relatively sanguine. I expect two more quarter-point rate hikes this year–likely in the summer and fall.